Most of us understand that we have to be better communicators whether it’s with our children, our spouses, friends and family and others in our work environment. One of the most common refrains when people talk about their relationships is that “he/she doesn’t listen.” We’re sure you’ve said it and that it’s been said about you. While we’re taught to read and write we’re not taught how to listen. If you were asked to describe what it is about a trusted friend or a mentor that’s important to you chances are you’d say, “He listens to me.” But what do we mean by that? Listening is a far more complex skill that is not easily taught.Each of us brings his or her own agenda to every conversation so to be a good listener we have to suspend our own agenda, quiet our brain and be attentive to what is being said. Most of us can hear since it’s a physical ability, but listening is a developed skill since it allows us to make sense of what another person is saying. Since we have to manage so many activities in our lives on the job and at home, we are most likely speaking more than listening. As we rush from one thing to the other, we overlook the simple mechanics of life, which is to acknowledge the world around us by pausing and, well, listening. We need to appreciate that listening is as powerful as speech because what somebody says to us is an important and critical component to learning how to be more sensitive, reflective, in the moment, and connected to those around us. Not only that, listening saves time and effort because those who truly listen make fewer mistakes and have fewer misunderstandings. 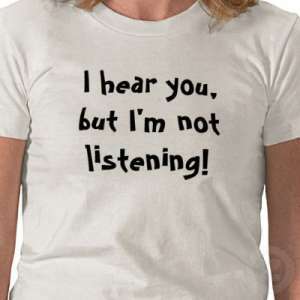 Too often we say, “I hear you” to acknowledge a conversation and to create a common understanding but if the reel inside our brain is focusing on the myriad of concerns, interests and challenges we’re silently ruminating about we’re hearing but not listening. Perhaps if we listened more attentively we wouldn’t miss so much that is important in communications, the nuances that reflect the true essence of the conversation and impacts the outcome. And if that happened, we’d probably be a lot happier , less stressed about our relationships and less in need of professional counseling. So are you listening?